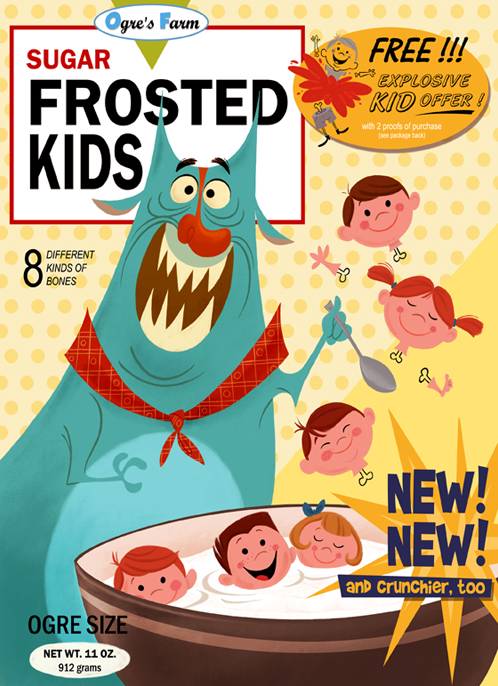 It's not just the sugar that will kill you... Cereal killers (left, and more) has some fun with the pop culture form. Is seafood charcuterie taking menus by storm in 2012? Reports from Boston and LA think so. The trend of high-end vinegars we've been hoping for seems to be on the move, with honey wine, verjus and Mexican banana. Invasive species burgers could be the solution to a wild iguana population. Puerto Rico will begin hunting and exporting the meat. "This is a very big problem. We have to attack it...It has impacted structures, the economy, crops and the ecosystem." Unfortunately, the Burmese pythons destroying South Florida mammal populations aren't so easy to catch. Maine looks for new ways to keeping fishing and fishing culture alive. "I've got all kinds of fisheries policy people, I've got all kinds of fisheries scientists. But we don't have anybody that creates that link back to shore-side business side of commercial fishing, and you can't have one without the other. We need the healthy fisheries, but we have to make sure we have a link back to the shore-side business that supports the sale and development of fish or lobsters or clams or anything else it might be."